The apartment is located in ground garden of a beautiful house in the small village of Bozel. In 2010 in a chalet style, it is completely equipped: refrigerator, dishwasher, oven and microwave, digital TV, free WIFI, barbecue, outdoor table and chair, recliner ... You have your own private parking space and can enjoy a reserved part of the grounds of the house. Bozel is a charming little village where you will find everything you need on foot in less than 5 minutes: restaurants, bars, grocery stores, bakeries, butchers, small lake with swimming area, etc. You are within 20 minutes drive from Courchevel (free shuttle service in winter - starting at 3 minutes from the apartment), Champagny, Pralognan La Vanoise. Summer and winter numerous activities are offered in all these small villages. COURCHEVEL access by free shuttle winter - Departure of the Town Hall of Bozel 4 minutes walk (even with ski boot). Access to the bathroom from the bedroom. Cleaning is the responsibility of the tenant. ticked every box for us - great location with all that we needed for a fantastic week in Bozel. Really enjoyed our stay in Bozel. 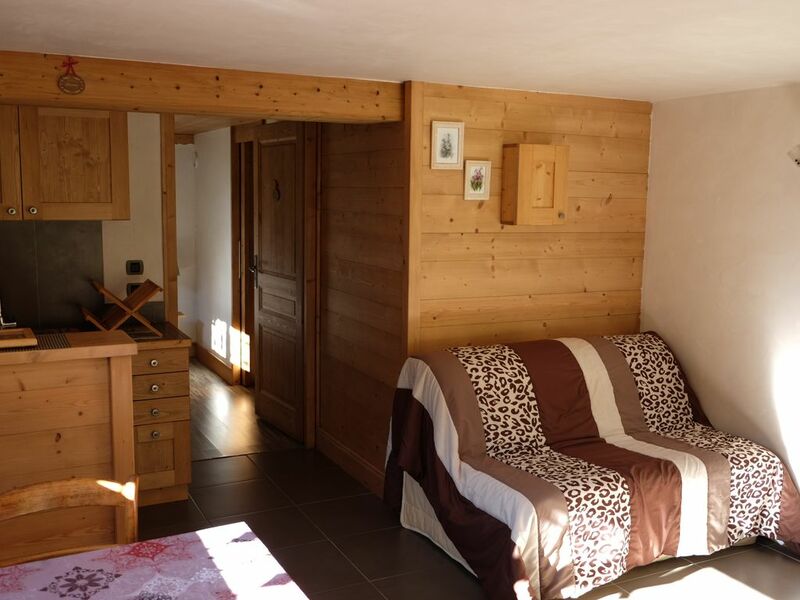 Normally rent a chalet in La Tania but found Bozel and the apartment a great combination to enjoy a beautiful village - great cycling and walks around the lake. Thanks Joelle for a fantastic holiday. The apartment was perfect for our needs! Clean and modern, with a well equipped kitchen. One of the most comfortable beds I've ever slept in! Great location in bozel, just a short 2-min walk to the village centre, and free ski bus to courchevel. Very friendly family, well looked after with easy booking, payment, communication etc. Quiet location, nice views, private parking,, and nice to be able to sit out in the sun! Would highly recommend! Accueil convivial l'appartement propre et bien aménagé la vue sur les montagnes super appartement proche des commerces pas besoin de prendre la voiture pour faire les courses. De belle balade à faire . environnement très tranquille pas de bruit. Les propriétaires sont très gentils et discret. The apartment had everything we needed for a hillwalking holiday (even washing machine and dryer, although this is not advertised). Monsieur Duraz answers e-mails and telephone calls very fast. His mother, Madame Duraz was very kind and sociable we had much fun talking French/English/German/Hand+Feet. It also seemed to be no problem when we just tiredly hobbled into the house with a 'ca va?' 'ca va bien!' on our way to our beds. We never heard her in the upper floor and thus had a good sleep. The apartment and the bath are spacious for the price, as compared with Scotlands islands or Norway. Bozel is cute and has all the basic shops one needs (supermarket, bakery, pharmacy, tourist Information). We had checked the apartment's location on Google maps, expecting to find it on a side street some distance from the main thoroughfare of bozel but the apartment and its small terrace and the garden patch for the visitors all view said side street with parking spaces and behind them Bozel's main road. Thus it was good for us, who came in the evening and left at noon but lounging a full day on the property made no sense when so much beautiful nature is around. Otherwise we lacked for absolutely nothing and thus thank the owners for a very beautiful holiday. bonjour, nous avons passé une semaine à BOZEL dans cet appartement idéalement situé dans le village; à la fois au calme et proche de tous les commerces. Il y a pleins de randonnées à faire et de belles choses à voir aux alentours. la literie est impeccable. Les vacances était excellentes malgré un soleil qui, en fin de semaine, jouait à cache cache avec les nuages !! Tout était parfait ! Le chaleureux accueil de la propriétaire malgré notre arrivée tardive, les bons plans randonnées ;-) Appart très cosy, situation impeccable ! Nous avons vraiment passé un séjour ressourçant chez vous ! Un tout grand merci ! At the foot of the Vanoise National Park, in the center of prestigious resorts: Courchevel (10kms), Méribel (15kms), Champagny-en-Vanoise, Pralognan-La-Vanoise (13kms) and Brides-Les-Bains, a spa town (5kms) . Les prix sont indiqués pour deux personnes. Il faut compter 25€/semaine/personne supplémentaire. Pour rappel, maximum 4 personnes.